When learning how to cook flounder recipes, first understand the type of fish this is. The texture and taste of this fish can vary depending on the location which it is caught and the preparation immediately following the catch. Even though flounder is abundant on the Eastern coast of the United States, I find most in the supermarkets is from other countries like China. When you can purchase it fresh from the ocean or caught yourself, it is much better. It was readily available fresh years ago when I learned how to cook flounder recipes. Flounder is a thinner flat fish with both eyes on one side of the head. This fish, whole or in fillets, can be cooked by most cooking methods. It is a mild tasting white fish with a soft texture. Due to the soft texture one of my favorite ways of cooking it is by stuffing. The fillets can be layered or these thinner fillets roll easily around many different types of stuffing. Most often these recipes are baked making a delicious and a very nice presentation. I have learned how to cook flounder by baking with so many different herbs and other ingredients. Besides the wonderful stuffed recipes, ingredients like tomatoes, mushrooms, cheese, orange and even other sea foods make fabulous unique dishes. Like many other seafood and fish, paella is a popular recipe for using flounder. Let us also remember that flounder is great for the microwave, broiling and cooking on your in a fish basket on the grill. The cooking is quick because of the thin fillets and a light seasoning is all that is needed. If you are just learning how to cook flounder recipes, you will find frying it is the most popular for most people. If you like deep fried battered fish, a thin batter is best. Heavier batters can overcome the mild fish flavor (But some love the batter as much as the fish). Other pan fried fish recipes dredge the fillets in breadcrumbs, flour, cornmeal or a mixture. Light seasoning of salt, pepper, paprika, lemon peel etc. is usually enough because of the mild flavored fish. Flounder can also be steamed or boiled in water. I do not typically cook it in these ways because the texture is so soft. What I do is add it to many stews and soups when I want a good fish flavor. Sometimes when I have extra pieces of different types of fish (Often flounder) and seafood left in my freezer, I make a big pot of seafood chowder. This is so delicious and the more types of seafood in the pot the better the taste. NOTE: If learning how to cook flounder for entrees, plan about 6 to 8 ounces for each adult person. 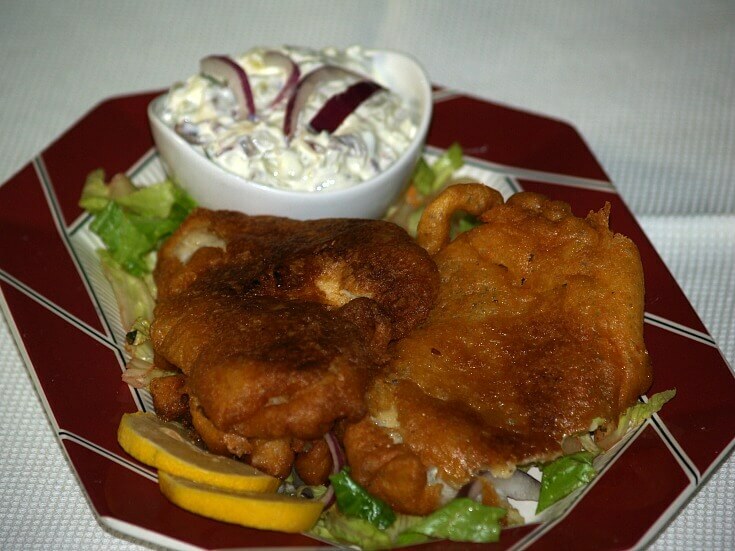 If you like battered fried fish, this is how I learned to cook flounder recipes. You can add other mild seasonings like a pinch of dill, paprika or onion powder to this batter. Rinse flounder in fresh water; drain on paper towels. Pat fish dry with paper towels; set aside. Combine flour, soda, salt and baking powder in shallow dish. Slowly beat in buttermilk until smooth; set aside. Heat about 1 to 1 ½ inches vegetable in large Dutch oven. Dip fish fillets in the batter covering completely; drop in hot oil. NOTE: DO NOT crowd fish fillets during frying. This makes a crisp puffy crust on the fish which can be used on other types of fish. Cook until browned on both sides (Only couple minutes on each side). 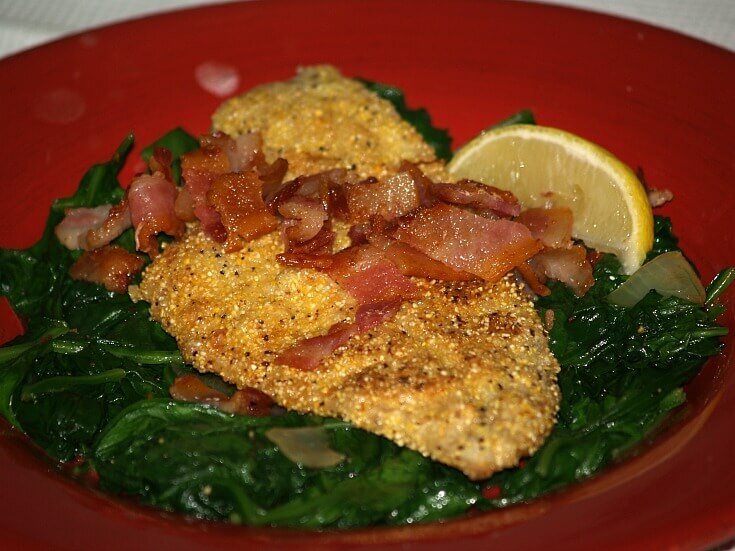 Learn how to cook flounder recipes with bacon seasoning. In large skillet fry the bacon until crisp and drain; reserve drippings in skillet. Season fish with salt and pepper; set aside. Blend water and egg together; set aside. Dip fish in egg and water; coat with flour cornmeal mix. Fry fish in hot bacon drippings over medium heat; brown on both sides. Serve with crisp crumbled bacon; serves 4 to 6. Learn how to cook flounder recipes by using the microwave. Place onion, garlic, pepper and oil in a large casserole dish. Place in microwave; heat on HIGH for 5 minutes. Add tomatoes and juice, saffron, broth and seasoning to dish. Heat on HIGH for 8 to 10 minutes; let stand 5 minutes. Cut fish into bite size chunks; add to casserole dish. 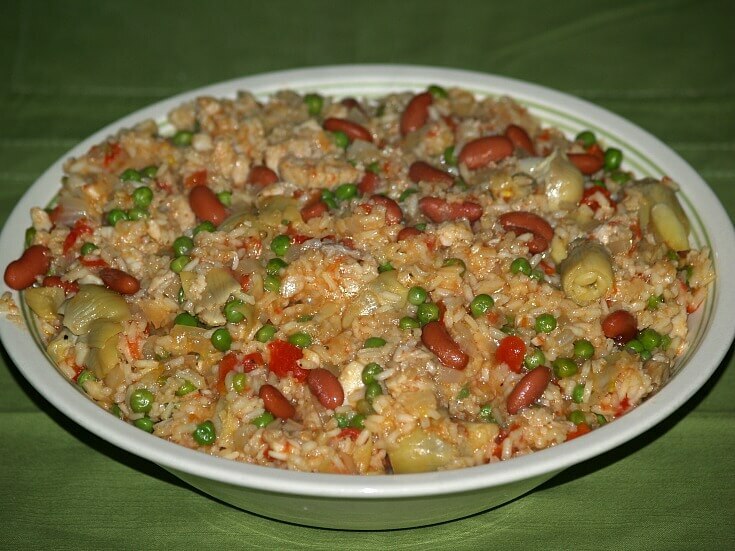 Stir in the rice and peas; heat on MEDIUM for 12 to 15 minutes. Add artichokes and beans to casserole; heat on HIGH 3 to 5 minutes. Fluff mixture with fork and adjust seasoning; serve immediately. 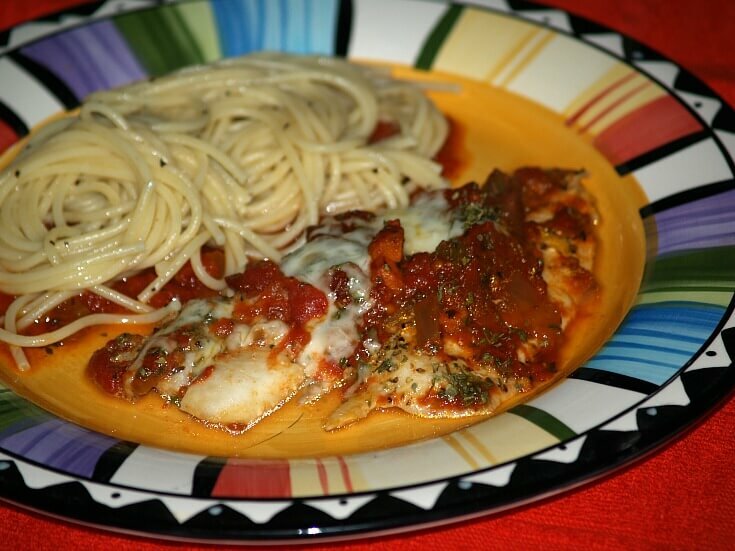 Learn how to cook flounder recipes with spaghetti sauce and mozzarella cheese. 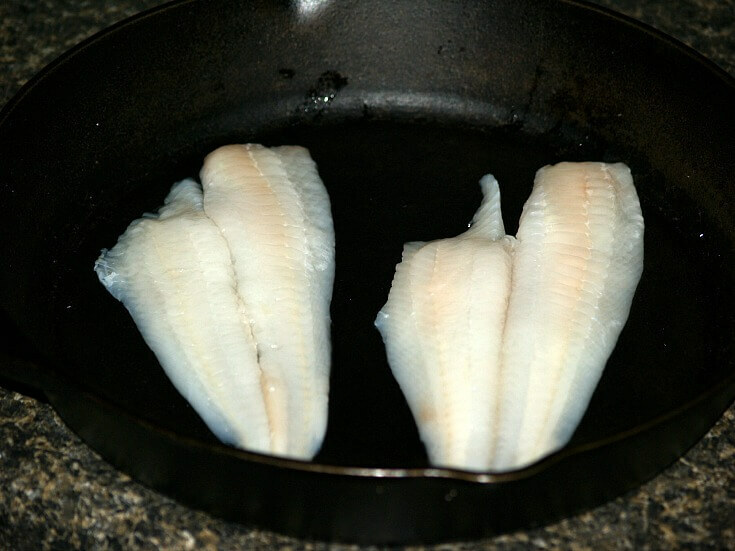 Arrange flounder fillets in lightly greased 9X13 inch baking dish. Sprinkle fish with oregano and pepper; pour spaghetti sauce over fillets. Sprinkle top with parsley; bake 20 minutes until fish flakes when tested. Top with cheese; bake additional 5 minutes. Learn how to cook flounder recipes by frying using bread crumbs. Mash butter with parsley and lemon juice; shape into a roll and chill. Rinse fish halves with clean water; drain and pat dry. Season the flour with salt and pepper; coat the fish. Beat the eggs in a shallow fish; spread bread crumbs on a plate. Dip the fish in the egg covering completely on both sides. Dip into the crumbs pressing lightly until evenly coated. Heat the oil in a large skillet; add 2 or 3 of the coated fillets (skin side up). Fry 3 to 5 minutes; turn over carefully and cook 3 to 5 minutes longer. NOTE: Fish should be tender and coating should be crisp. Lift fish out with a spatula; drain on paper towels and keep warm. Fish cooking remaining fish; arrange on a warm serving platter. Slice the parsley butter; garnish with slices, lemon slices and sprigs of parsley. Learn how to cook flounder recipes broiled with Parmesan crust. Preheat broiler; place fish fillet on greased broiler pan. Spread fish evenly with mayonnaise; top with Parmesan cheese. Broil 5 to 6 inches from heat source 6 to 8 minutes until brown and fork tender. Learn how to cook flounder recipes with Italian seasoning. Arrange fish fillets on greased broiler pan. Blend butter with lemon juice, salt, pepper, mint and oregano. Spread butter over fish fillets; broil 3 inches from heat 3 to 5 minutes. NOTE: Fish will flake when tested with fork. Sprinkle with paprika; garnish with parsley, lemon wedges and black olives. Learn how to cook flounder recipes with a mild Asian touch. Lay fillets in a greased baking pan; top with teriyaki sauce and lemon juice. Bake about 15 minutes or until fish flakes. In skillet melt butter and brown the garlic. Stir the almonds in the skillet cooking a few minutes. Spoon mixture onto the fish and serve hot; serves 6. Learn how to cook flounder recipes with fresh tomatoes. Place fish fillets in 9X13 inch baking dish. Sprinkle fish with salt, pepper and paprika. Place tomato slice on top of each fillet. Sprinkle with chopped onion, Cheddar cheese and parsley. Pour Italian dressing over the top; bake 20 minutes. Learn how to cook flounder recipes by using crab stuffing. Melt butter in large skillet; add celery, onion, parsley, shallots, green pepper and garlic. Sauté over medium heat until vegetables are tender; add flour and stir for 1 minute. Gradually add milk and wine stirring constantly until mixture is slightly thickened. Remove from heat; stir in crab meat, bread crumbs, salt and pepper. Place 6 of the fillet HALVES on greased jelly roll baking sheet. Spoon about ½ cup of the crabmeat stuffing on each fillet. CUT remaining fillet halves in HALF LENGTHWISE. Place 2 of the FOURTHS on top of each stuffed filled. Press fillet fourths gently into the stuffing mixture. Top each portion with Mornay sauce; sprinkle with paprika. Bake 15 to 20 minutes until fish flakes when tested with a fork. Garnish with parsley; serves 6. When learning how to cook flounder recipes or other fish, serve with this delicious Mornay sauce. Stir in flour until smooth about 1 minute. Gradually stir about a fourth of hot mixture into yolks. Return and stir yolk mixture back into saucepan. Cook stirring constantly until thickened about 2 to 3 minutes. Stir in cheese until melted; remove from heat and serve. Learn how to cook flounder recipes by baking in oven. Cut fillets in half crosswise making 12 pieces. Combine crumbs and melted butter together in a bowl. Add green onion, parsley, poultry seasoning, scallops and mushrooms. Combine mixture well; place a piece of flounder in bottoms of 6 ramekins. Divide stuffing evenly on top of fish in each ramekin; top with remaining fish. Heat butter in a saucepan; stir in flour, salt and pepper and cook until bubbly. Add milk gradually stirring until smooth; bring to boil stirring for 1 to 2 minutes. Spoon sauce over the flounder; sprinkle with cheese and bake 20 to 25 minutes. Au gratin is a great method when learning how to cook flounder recipes or other fish. Sprinkle oil in shallow baking dish; add chopped onion. Arrange half of the fillets on top of onion. Top fillets with sliced tomatoes and bay leaves. Sprinkle with salt, pepper and chopped parsley. Cover with remaining fish fillets; pour white wine over top. Sprinkle the top with bread crumbs and cheese; dot with butter. Bake about 25 minutes until golden brown on top; serve immediately. Since I learned how to cook flounder fillets, stuffing is my favorite. 4 to 5 Pounds whole flounder (Cleaned, scaled and boned BUT head and tail left on. TO PREPARE STUFFING melt butter; sauté shallots until soft. Add spinach; cook 2 to 3 minutes to evaporate moisture. Transfer to a bowl; add crumbs, cream, lemon juice, salt and pepper. Blend mixture well; set aside. TO PREPARE wash fish thoroughly with fresh water. Dry fish thoroughly with paper towels. Fill the fish with the prepared stuffing. Lace fish closed with small skewers and crisscrossed string. Brush 2 tablespoons of melted butter in a shallow baking and serving dish. Place fish in dish; brush top with 2 tablespoons melted butter. Combine remaining 2 tablespoons melted butter with wine. Pour butter wine mixture over the fish; bake 40 to 50 minutes. NOTE: Bake on middle rack basting about every 7 minutes. If needed add up to ¾ cup of additional wine. Transfer juice to small pan; reduce over high heat until syrupy. Remove from heat; stir in the 1 tablespoon softened butter. Pour mixture over fish; garnish with parsley or watercress and lemon. Serves 6 to 8; good with hollandaise sauce. When chefs learn how to cook flounder recipes, many favor adding the taste of orange. Layer half of green onion and mushrooms in greased baking pan (9 inch). Add fish; sprinkle with salt, pepper and Italian seasoning. Top with remaining onions and mushrooms. Combine olive oil and next 4 ingredients; pour over the top. Bake for 40 minutes until fish is opaque. Sprinkle with paprika and parsley; serves 2 to 3. Learn how to cook flounder and serve with a delicious lime and ginger flavored salsa. Coat with spray a grill tray or a tray to put under broiler; place fish on tray. Cook over hot coals or under hot broiler until done about 10 minutes. Combine all ingredients tossing gently to coat; cover and chill 2 hours. NOTE: To roast jalapenos, place on foil lined tray. Broil 5 ½ inches from heat with door partially opened about 5 minutes on each side. Place in a heavy duty zip top bag; seal and let stand 10 minutes to loosen skins. Peel peppers and discard seeds.